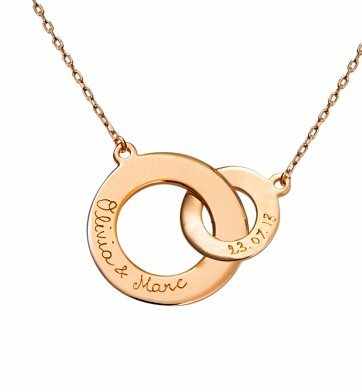 Hanging from a rose gold plated 18" chain, two rose gold interlinked eternity pendants will be engraved with your chosen inscription. Whether you want the personalization to represent the bond between mother and child, two inseperable lovers or long time friends, the choice is yours. All of the engraving is done carefully by hand in a charming French cursive style. One Rose Gold Plated 18" Chain with Two Eternity Pendants. Free Engraving! Up to 25 characters can be engraved on the large pendant surface, and 15 characters on the small pendant. Enter information to be engraved using the personalization option during checkout. Rose Gold Intertwined Necklace is a hand delivered gift. These gifts are delivered by one of our local design centers located throughout the United States and Canada. Same day delivery is available for most gifts when ordered before the cutoff time. The cutoff time for Rose Gold Intertwined Necklace is in the recipient's time zone.